This meal was from one of those nights where I didn't have something 'planned' and I hadn't been to the grocery store yet - so I had to use what I had available in the house at the moment. I enjoy the challenge of figuring out what to make in this situation (and avoid giving up and just getting take-out). I usually have some individual salmon portions and I always have frozen spinach on hand - so these recipes were perfect! 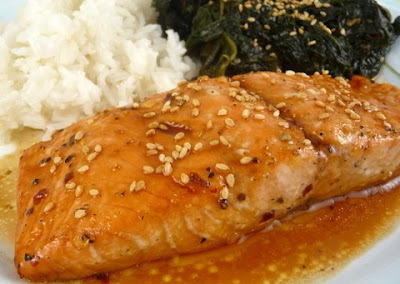 I love the taste of soy sauce on fish - so I really enjoyed this recipe. My husband prefers my standby salmon recipe to this one - but I think I would still make this recipe again. I used frozen spinach (since it was all I had on hand) but this would be so much better with fresh spinach. 1. Preheat oven to 400 degrees. Combine sugar, soy sauce, oil, lemon juice and wine in a small bowl and stir to combine. 2. Place salmon in a baking dish and cover with the glaze. 3. Bake for 15 - 20 minutes - occasionally basting with the glaze. Check the temperature of the fish - it is done at 130 degrees. Garnish with sesame seeds. Heat the oil in a large skillet. Add the garlic and cook for 30 seconds. Then add the spinach and soy sauce. Cook until spinach is wilted and heated through. 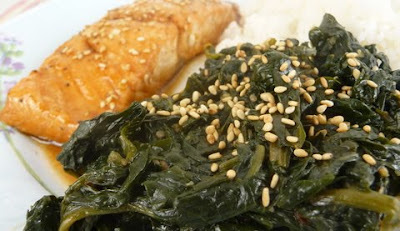 Garnish with sesame seeds.